This website and community has been around for just over two years! While I’ve been a full-time coach for almost 6.5 years over at The Revolutionary Club, this little project just became a full-blown toddler :). …the truth is I’m more like this! Now, a lot of things work in my business, both here at Coach Pony and also over with the career folks at the RevClub. I’ve made more money than I could have ever imagined back when I was a new coach. And I’ve served far more clients than I ever thought possible, and that makes me glad. Honestly, I never thought I’d have thousands of paying clients. When I started out, I just wanted one. But because I’m human, I *of course* screw up. So, I was thinking about some of the things I’ve done well, and badly, to celebrate this awesome community reaching toddler-ship. I have a team of people I work with, but the one who is my rock is the person in the role of online awesome manager, or my business manager. This is the person who is the entire glue of my business, and keeps everything else running so I can focus on content and coaching. For years I worked closely with one person in this role, Shannon, who is amazing. Then she got married to a Brit and decided to leave the US for the UK. I live in California. She lived on the East Coast. I sometimes struggled with the 3-hour time difference, but since Shannon seemed to never sleep or be offline, she made my life easier. And I told her she should definitely go and nothing needed to change, as I could totally handle the communication lag (even though I struggled with 3 hours at times). Obviously, I wasn’t being fully honest with her, or with me. Then…the time difference became 8 hours. And Shannon decided to be a normal person and start sleeping. So with a time difference of 8 hours, and we only overlapped for about an hour a day, and almost never on Friday, because she – like me – enjoys knocking off early on a Friday (and I support that). Over about 9 months, I slowly lost my mind. I am someone who LOVES communication. I value OVER communication with my team. And if I’m stressed about something I tend to shoot off emails until I get a response. I try and warn everyone about this before we start, so they are prepped. So you can imagine how much I disliked not being able to talk to a key member of my team on a daily basis. Then we hit a crazy patch, with tons of time-sensitive stuff happening, and the time lag was impossible. Fortunately for me, Shannon is a better human than I am about this stuff and gently told me that 1) She was moving to the EU so another hour would be added to our split and 2) Maybe it was time she moved on and I found someone west of the Mississippi. Even though I was tremendously unhappy with the situation, I don’t know if I would have made the decision without Shannon’s classy push. But she found me a replacement (hey Ruth! ), and life is so. much. easier. It was a months-long screw up because I KNEW I couldn’t handle that kind of time difference, but I myself love to travel and I hated the idea of not supporting someone else in theirs. Instead of facing the problem up front, I hid from it, got gradually more stressed, and turned into a small monster. Being an entrepreneur will teach you more about yourself than you can ever imagine, and much of it won’t be pretty. But I encourage you to not pull a me, and when you know something won’t work for you in your business, say so. Don’t waste time and energy in a situation that’s stressing you out. You’ll figure something else out and it will be okay. I spend a lot of time on Facebook – it’s not my main marketing platform, but it is a useful tool. About a year ago we ran a big Facebook ads campaign to help get the word out about Coach Pony. 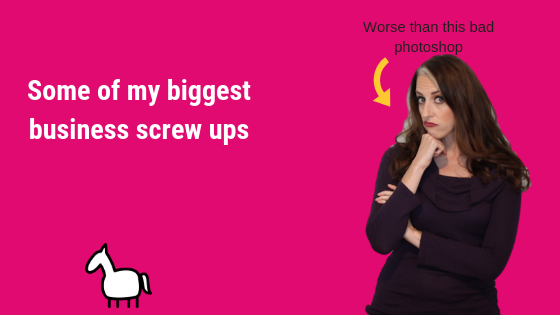 I always like to shoot for fun or funny ads, and of course, they invite commentary. A lot of people made some mocking commentary on my ads, trolling that being a life coach is hilarious since it’s not a real thing, and one morning, after very little sleep, I opened my browser to see another comment along those lines. Except this one was nastier than any I’d ever seen before…and I’ve seen a lot. Normally I laugh them off – they don’t know me, I don’t know them, it’s fine. But that day I felt ANGER. And I did something I never do. I engaged. I pointedly took him down. I tried to be thoughtful about it, but I was also angry. ...and before I knew it, I had a one-star review for Coach Pony on Facebook. Instead of engaging with me further, he decided he should just go to my page and leave a one-star review. No commentary, no explanation. How could he explain? He never went to the Coach Pony website or bought any of our stuff. He didn’t even read one single blog (I know this, because he had told me in one of his comments on the ad, right before he left the review. And right after I saw it, I searched his name in our contact list to make sure he wasn’t a client). But because he was the ONLY review, now Coach Pony looked terrible on Facebook, on google search, in general. That star haunted us. My first lesson was this: Never engage with your baser instincts (especially with a troll). I woke up tired and annoyed, and I put that out into the world against someone already angry, and of course it didn’t end well. I know better. In fact, I’ve talked to you guys about this at length! …and we are now back up to 4.9 stars! All 5-star reviews, except for that troll. Having essentially two businesses is interesting. 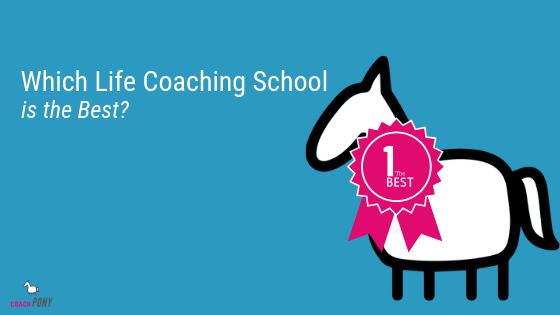 I’ve committed this year to making Coach Pony my primary focus (read about my year plan here if you are curious). But there was a time in the last two years when I took on WAY to much. 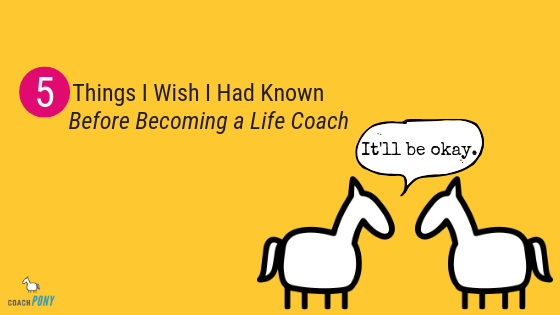 I was running an advanced-level mastermind program with a retreat, I had two main launches back-to-back for the RevClub, one for Coach Pony… and I was planning my wedding. Oh, and I decided to also revamp one of my programs! All of these things bring me joy, but doing them all at once was like eating 5 lbs of chocolate. It *seems* like a good idea at the time, but it’s SO NOT A GOOD IDEA. Lots of stress, a lot of anxiety around making sure nothing in our crazy plans fell through the cracks, and one night where I said “I’m not sure I can do all of this” except…clients had bought into all of it. We had to go forward. With a lot of deep breaths and help from my team, we made it through. We completed everything and served all our clients, I showed up to my wedding on time, and excitingly I fit into my dress (with a save from my parents who were like “How can we help?” and I had this sudden thought of panic, which was “where IS my wedding dress?” and yes, they went out and picked it up for me *whew*), but it could have been a much more relaxing process if I had just taken a breath and really thought about what I was taking on. There’s something in me that starts to feel overly-stretched when I get to the edge of my energy, and I pretty much blatantly ignored that. My husband was not happy. For me, the lesson is clear: Listen to my gut. Or put another way, when I plan out my projects, always take at least one thing off of the table before moving forwards. Being an entrepreneur is hard, it requires a lot of energy in terms of doing all of your business operations, but it also requires a lot of energy in terms of pushing outside of your comfort zone. I’ve done about a billion launches and run big six-figure programs. But, each time I do one I’m still nervous. And each time I try something different it takes a lot out of me. And as much as I love my business (I love it you guys, this is my favorite place), my life also needs attention. As I mentioned, my husband was not thrilled when he realized what I had planned before the wedding. First off, I’ve only covered three big screw ups and we are already over 1500 words. There is so much more, but maybe this is enough for now? Mostly, I hope that by sharing some of my mistakes I’ve lessened your burden to get things right as a new or newer coach. Frankly, none of us are perfect, things will not work, and you will still be okay. Want to work together? YES! Sometimes you need help in your business, and that’s okay! 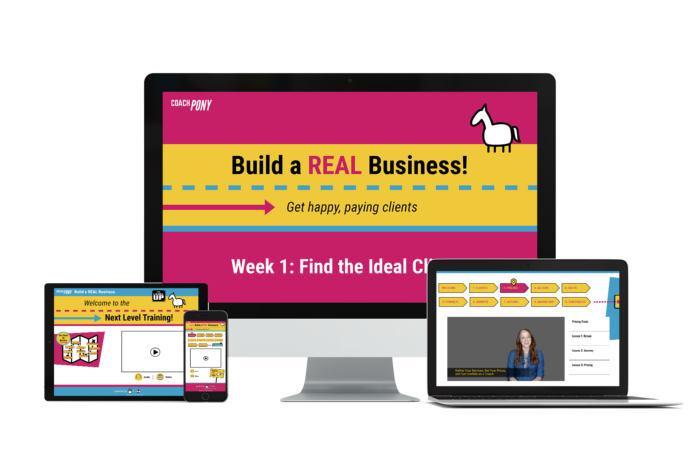 Here’s how we can help: We quietly re-opened Build a REAL Business last month for enrollment, and you can join now and learn how to build a coaching business full of happy, paying, clients. My goal is to give a you system that makes your life SIMPLE. So we talk about the big picture (strategy) and the small picture (what you should write in an email and exactly what to charge! ), so you have all of the pieces you need to excel in your business…and get clients :). Mostly, I want you to be a coach with a warm cup of coffee in one hand, a thank you note from a delighted client in the other, and a bank account that makes you happy :). You can start the program as soon as you sign up. Learn more and join us here! This entry was posted in Coaching Lessons, Inspiration on September 7, 2018 by Christie.